All cranes available in electric version also AC 3 Phase (Lifting operation). G-Models offer a larger clear space for lifting ahead of the wheels & can be used effectively in areas in accessible to the (U) Frame type & in preferred for lifting of larger, outward & unsymmetrical loads. Strong, robust, sturdy and built to very high standards. All cranes are fitted with 360 degree rotating forged steel hook. Heavy duty thrust bearings and taper roller bearings on steering assembly for easy manoeuverability. Compact and integrated hydraulic system. Five speed variable displacement hydraulic hand pump with replaceable cartridge, valve inserts and built in relief valve to protect against overloading. Heavier loads require a larger lifting effort. Appropriate lifting speeds could be selected to keep the lifting effort at suitable levels. The pump is fitted with a automatic pressure compensated lowering control valve to prevent sudden lowering of the load. The hydraulic cylinder is connected directly to the pump manifold. There is no hose pipe connection, thus reducing the chances of damage due to a burst or cut hose. A top of stroke bypass prevents top jamming of the ram at the maximum elevated position. Hard chrome plating on the hydraulic ram protects it from corrosion and rust. All "G" - model cranes have two column positions. Position I requires more counter weights. However it also permits a longer reach as compared to position II. All Cranes are supplied with an empty counterweight tank into which the user has to place appropriate counter weight before use. All cranes available in electric version also (AC 3 Phase)lifting operation. The chassis is (U) shaped and the job to be lifted is accommodated within the frame itself. 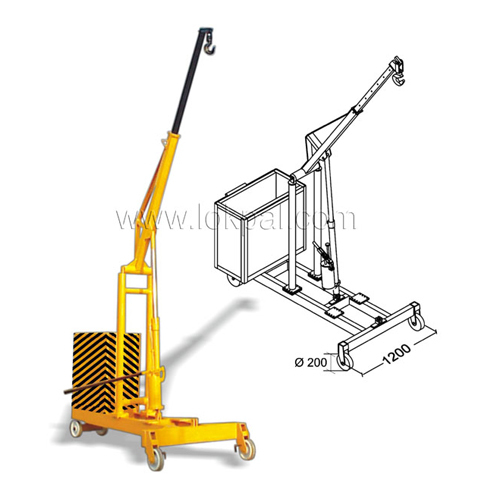 The equipment is use full for loading and unloading jobs into trucks & other areas, where the legs can be easily moved. Slide under obstructions. The advantage of this equipment is that being shorter in length it has a small turning radius and no counter weights are required for loading moment. 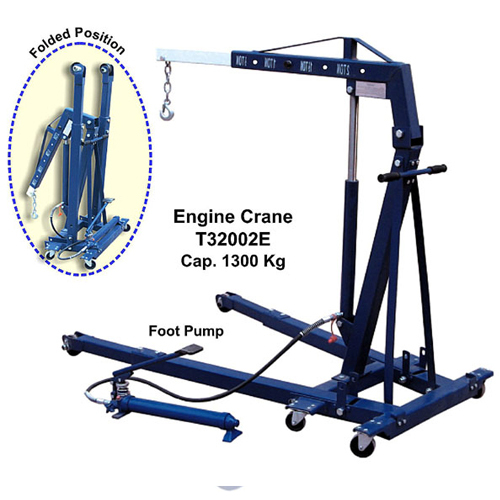 Hydraulic Engine Crane T-32002E is useful for handling & lifting small dies, tools, engines etc. Can be folded and stored in tight spaces. 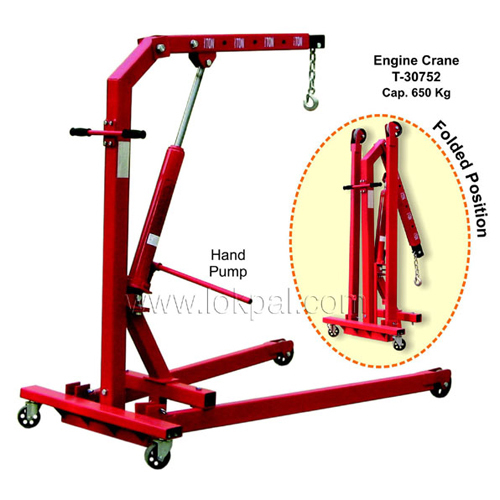 Hydraulic Engine Crane T-30752 is useful for handling & lifting small dies, tools, engines etc. Can be folded and stored in tight spaces. 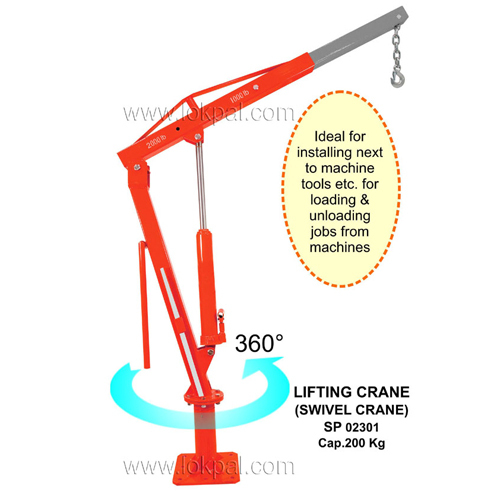 Swivel Crane ideal for installing next to machine tools etc. 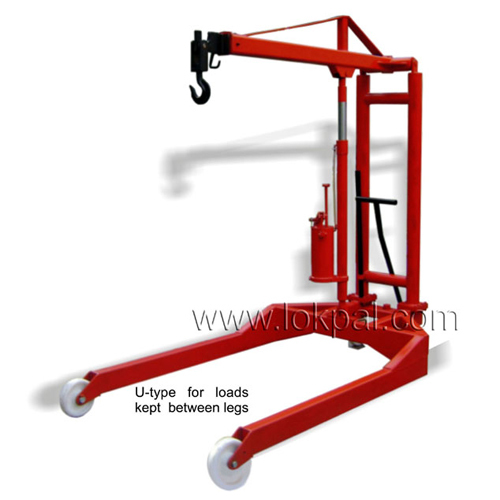 for loading & unloading jobs from machines.